The fin whale (Balaenoptera physalus) is a huge baleen whale. It is the second largest animal on Earth (the blue whale is the biggest). This whale is sometimes called the "greyhound of the sea" because of its fast swimming speed; it can swim up to 23 mph (37 km/hr) in short bursts. The fin whale is also called the finback, finner, razorback, common rorqual, and herring whale. The fin whale is a streamlined whale that is found worldwide; it is most common in the North Atlantic. 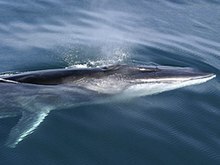 There are three separate populations of fin whales, one in the North Pacific, one in the North Atlantic, and one in the Southern Hemisphere; they do not interbreed. Many groups of fin whales migrate between feeding grounds and breeding grounds. This whale usually swims in pods of 3-7 whales but larger groups (up to 300 animals) may form at rich feeding grounds. Fin whales are filter feeders that eat plankton (tiny crustaceans like krill and copepods) and small fish from the water. They have very fine grey-black baleen that traps very small particles of food. Each side of the upper jaw has 270-470 baleen plates. Wikispecies has information on: Balaenoptera physalus. This page was last changed on 9 March 2015, at 07:27.